Sterling is a very even mid grey. His saddle area has only one small spot. 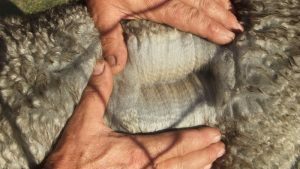 He is a nicely grown boy who carries a fine, well defined crimpy fleece. He has very little guard hair or primary fibre. His sire the late Bumble Hill Shillac has regularly sired progeny of an elite quality including a number of stud males. 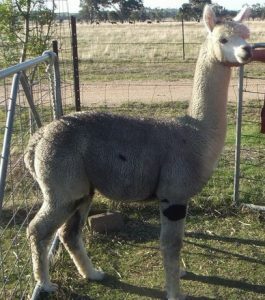 His dam Fuschia is also a very even coloured grey female who has only ever produced grey progeny. He has a beautiful quiet, but inquisitive nature and was a dream to halter train. Photos taken in April 2017. He comes with a certification and fertility guarantee. Micron 18.4, SD 4.0, CV 22.2. Shorn 02/10/2016 at 21 months old.